Glamarama began life as a precociously fabulous little gay boy that loved sparkles, petticoats and elaborate headpieces. As fate would have it his flamboyance wasn’t frowned upon and he was readily urged to be himself and nurture his creativity! As a friend of many Sisters his need to share that desire to create beauty as well as instruct our community to love their own uniquely fabulous selves was recognized. 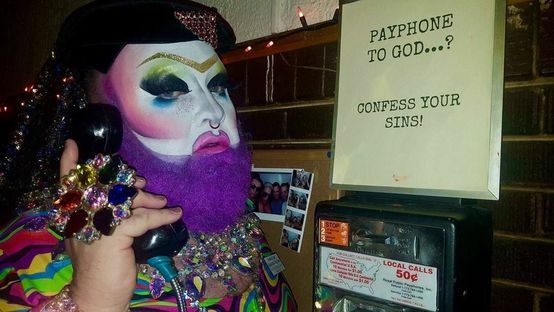 With a handful of like minded people he was asked to start a mission house of Sisters of Perpetual Indulgence in Kansas City. With the flick of a brush or twenty he took to the calling of the veil naturally and shares his gifts for dispensing glamour and recognizing your own magical beauty readily! Glamarama loves interacting with the local LGBTQ community dispensing knowledge on our past while keeping a heavily lashed eye on the present all the while looking to our future!